Since Scott has been around the industry a long time, he has seen a lot of shiny new objects come and go. 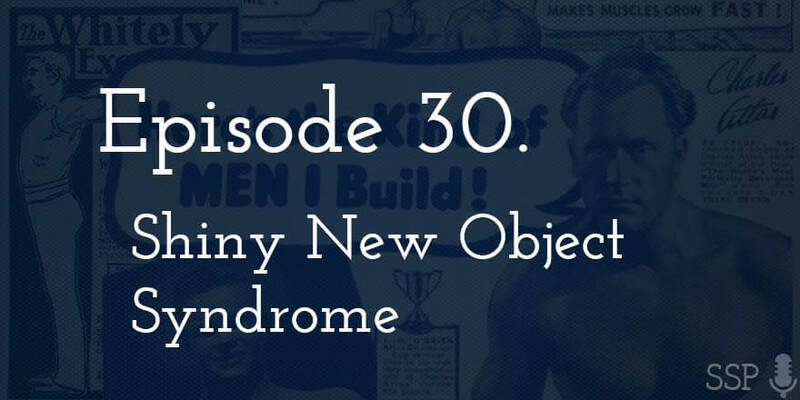 This episode was all about those shiny objects, and how to ignore them, move on, and focus on the principles that really matter. Some examples of “shiny new objects” (i.e. trends) that were discussed: TRX, Bosu Balls, Kettle Bells, Battling Ropes, Reverse Dieting. The podcast began with Scott noting that the price of success, sometimes, is just plain vigilance, ad sometimes there are no workarounds. The example he gave was sleep — if you don’t get enough sleep, that will be a huge roadblock to fitness success. This doesn’t mean there aren’t very legitimate reasons why you can’t get more, but there isn’t a way “around” this that isn’t just an empty promise trying to sell you something. Scott and Kevin ranted about people’s sense of entitlement. If you’re trying to deal with these lifestyle factors, you need to (1) be real and (2) really think about your priorities. To give some background, Scott considers his work as a capital-C Coach to be a craft. Bt the first rule of being a craftsman is that you don’t fetishize one single tool, nor do you blame your tools: no carpenter ever got certified in the screw driver, the way many trainers get certified in TRX, or kettle bells, battling ropes whatever. Here’s an example of the dangers of this: one of the “in vogue” tools right now is battling ropes. But these are not always a very good tool. If you’re over 50 or have shoulder problems, they are not good for you at all. They’re too hard on the shoulders. A lot of the things that work are just plain boring. They’re not shiny. They’re not new. They’re not that fun to talk about. But they’re the things that move the needle for you. A lot of the fitness industry sells the sizzle over the steak. At the same time, a program whose explanation is only legible to the coach or trainer is going too far the other way. Is there a happy medium? A lot of the changes in the industry have to do with the fact that weight loss and fitness, as market, is old, sophisticated, and saturated. Consumers are skeptical of this or that strategy, so in-depth “secrets” and overly-complicated explanations are used to justify… nonsense. This video has a good explanation of market sophistication (and conveniently uses fitness as an example). Mike and Scott discussed Amir’s gym (http://www.symmetrygymdubai.com/), which very nicely and harmoniously mixes important principles that are totally legit (biofeedback) with marketing (fancy custom one-on-one approach blah blah). These things don’t always have to be in conflict. Old Charles Atlas “hero of the beach” ads. A video on market sophistication.